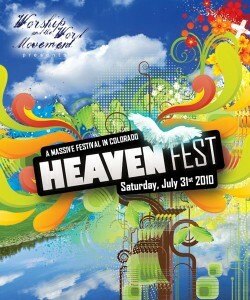 Heaven Fest 2010: July 31st! 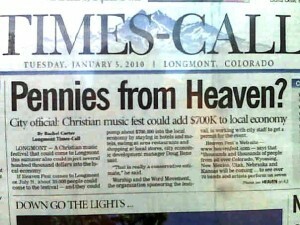 We were on the front page of the Longmont Times-Call for the 2nd time in less than 2 weeks (small city, readership maybe 80,000 – but the website comments going on—yowzers!). I did an interview for that paper last summer and somehow me talking about “God’s Presence” got turned into “God’s presents.” But it was nice overall (and the Presence is such a gift). image swiped from Joe Vasquez’s Facebook. Thanks, Joe. The artist line-up is looking good. I’ll let you in on a little secret: Casting Crowns has already confirmed and there is going to be a PETRA reunion! Yes! Can you believe it?? The Lord is opening really interesting doors in some intriguing places. Luke has unveiled the new groovy and much greener look (affectionately referred to by my sweet friends as “Jeanie green”) and things are unfolding in a beautiful God-loves-Colorado fashion! Woo-hoo! And the countdown clock is ticking away at the website. YIKES! Wanna help? You know where to find me! Rogers grove? There is no way that area is big enough! I live by it and have walked it. It would also shut down that part of town! O there is more than we can say presently. Much more. Ok I read the comments. I would rather have HF here than a gay pride or biker event anyday!